OTTAWA -- Andrew Scheer is challenging Justin Trudeau to follow through on a threat to sue him over his assertion that the prime minister politically interfered with the criminal prosecution of Montreal engineering giant SNC-Lavalin. The Conservative leader revealed Sunday that he received a letter on March 31 from Trudeau's lawyer, Julian Porter, threatening a libel suit. "I stand by every single criticism I have made of Mr. Trudeau's conduct in regards to this scandal, including those Mr. Trudeau's lawyer cites in his letter," Scheer told a news conference. "If Mr. Trudeau intends to pursue this course of legal action, if he believes he has a case against me, I urge him to do so immediately. This is an urgent matter of public interest and it deserves to be heard in a legal setting where Liberals do not control the proceedings." Scheer said he looks forward to Trudeau testifying "for hours" under oath in open court. That said, Scheer made it clear he believes Trudeau is bluffing. He called the threatened lawsuit "a bullying attempt" to prevent the official Opposition from doing its constitutional duty to hold the government to account and a continuation of Trudeau's attempts to "silence those who stand up to Justin Trudeau and who seek the truth" -- just as he tried to silence former attorney general Jody Wilson-Raybould, Scheer said. In a statement, the Prime Minister's Office said Scheer and his party "have repeatedly made false and defamatory statements. We put him on notice that there are consequences for making completely false and libellous statements." Wilson-Raybould maintains she was inappropriately pressured last fall by the Prime Minister's Office to stop criminal proceedings against SNC-Lavalin on bribery charges related to contracts in Libya. She believes she was moved to Veterans Affairs in a mid-January cabinet shuffle as punishment for refusing to override the director of public prosecutions, who had decided not to negotiate a remediation agreement, a type of plea bargain, with the company. She resigned from cabinet a month later. Last week, Trudeau expelled both Wilson-Raybould and fellow former cabinet minister Jane Philpott from the Liberal caucus. Philpott had resigned from cabinet in early March, citing a loss of confidence in the government's handling of the SNC-Lavalin case. At issue in the threatened libel suit is a statement Scheer issued on March 29 in which he said documentation provided by Wilson-Raybould to the House of Commons justice committee -- including a surreptitiously recorded phone conversation with the clerk of the Privy Council, Michael Wernick -- is "concrete evidence that proves Justin Trudeau led a campaign to politically interfere with SNC-Lavalin's criminal prosecution." Porter called the statement "highly defamatory." "The prime minister supports wide-ranging and vigorous political debate on matters of public policy," he said in his letter to Scheer. "However, your statement, in its entirety, is beyond the pale of fair debate and is libellous of my client personally and in the way of his occupation as prime minister." Porter said it's "entirely false" to say Trudeau interfered in the SNC prosecution, which has not been halted, or that he personally directed Wilson-Raybould to "break the law" and "fired" her when she refused. It's also entirely false to suggest Trudeau was aware of Wilson-Raybould's concern that he was politically interfering in the SNC case but lied to Canadians about it, Porter said. Scheer's statement that the affair amounts to "corruption on top of corruption on top of corruption" was meant to suggest that Trudeau "had engaged in dishonest and corrupt conduct that would contravene the Criminal Code," a crime deserving of up to 14 years in prison, Porter said. That too was "entirely false." Undeterred, Scheer repeated that phrase twice during his news conference Sunday. While Conservatives have embraced every other aspect of Wilson-Raybould's testimony as the absolute truth, they have not accepted her conclusion that nothing illegal occurred. "That was her opinion on that," said Scheer, noting that he's asked the RCMP to investigate whether any laws were broken. He said he's not heard anything from the RCMP other than an acknowledgment of his Feb. 28 request for an investigation. Scheer's lawyer, Peter Downard, wrote back to Porter on Sunday, saying that Scheer "will not be intimidated." If Trudeau is serious about suing, Downard said he must immediately take steps to preserve all relevant documents and to notify all members of his government, past and present, who've been involved in the SNC-Lavalin matter that they can expect to be called to testify. If Trudeau does not proceed with the threatened lawsuit, Downard said Scheer will conclude that Trudeau "has properly acknowledged that Mr. Scheer's statements were appropriate and grounded in evidence before the Canadian people." 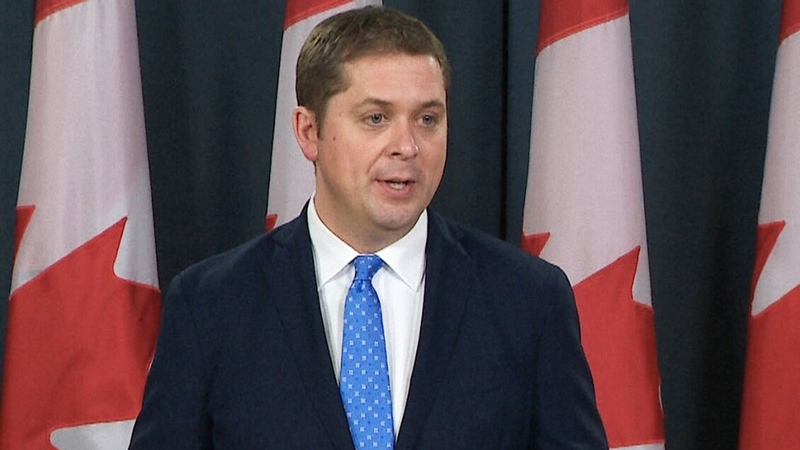 Conservative Leader Andrew Scheer says a lawyer representing Prime Minister Justin Trudeau threaten him with a libel suit over comments he made about the SNC-Lavalin scandal.